to see if there is room for your child. 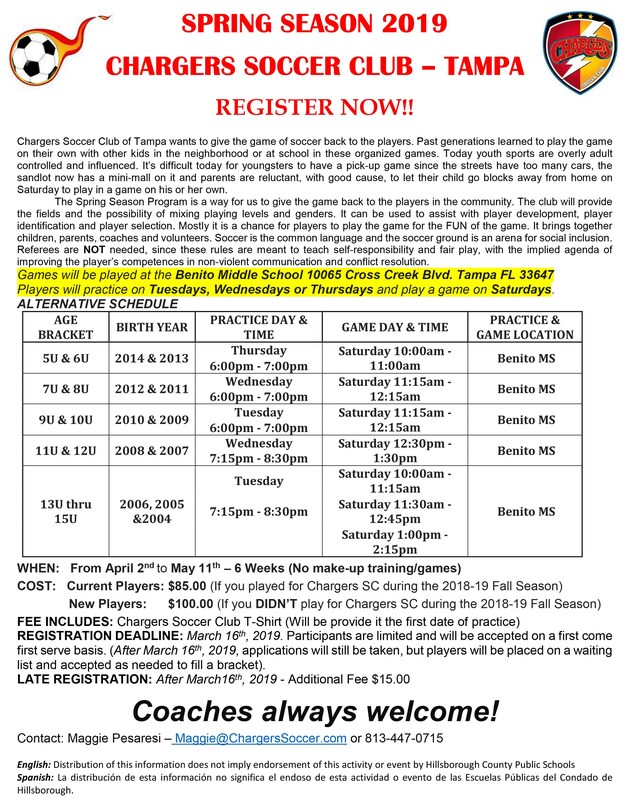 Chargers Soccer Club is proud to continue serving the New Tampa Area since the mid-1990s. Chargers S.C. welcome our community families to another exciting recreational soccer season. Our In-House Program season runs from November to February and the Traveling Recreational Program - TARSA from October to March. The primary goal of the Chargers S.C. Recreational Soccer Program is not about winning, but to offer every player the opportunity to enjoy the game in a fun learning environment while honing new skills. Our recreational soccer program is for boys and girls between the ages of 4 and 19. The Fall Rec Program consists of 2 separate programs (based on age group*). CLICK HERE for the 2018-19 Age Group Matrix. Then once you have confirmed your child's age group, click the corresponding program link below for more detailed information (fees, dates, practices, games, etc.). * The "U" listed with the age group stands for "Under". When an age group is listed, that stands for those of that particular age and under. For example, 10U stands for those who are already 10 or are currently 9 year olds that will turn 10 during the season. Age groups are determined by birth year. CLICK HERE for the 2018-19 Age Group Matrix. You can register from the comfort of your home or office by clicking REGISTER HERE. The online registration process is the first step. Once this step is completed, the following information MUST be uploaded directly to your child's Got Soccer account (CLICK HERE for easy directions). If you prefer our assistance to register you can attend one of our onsite registration dates listed below. Uniform samples for sizing will be available. WE LOOK FORWARD TO AN AMAZING SEASON!